A number of proposals for a monument to Sir George-Étienne Cartier were made in the years following his death in 1873. However, it was not until 1912 that a national competition was launched. Nine sculptors made submissions, including Alfred Laliberté and Georges William Hill. It took an extraordinary order to choose the artist for the project, and Hill was the winner. 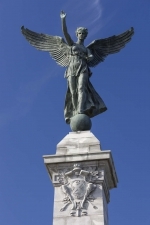 The composition of Hill’s monument is articulated around 18 figures. Guarding the front and rear approaches to the monument, four recumbent lions symbolize the power and protection of the British Empire. They are set on low walls that frame a two-flight set of stairs giving access to a large terrace in the centre of which stand the 18 bronze figures, placed around a pyramidal column. 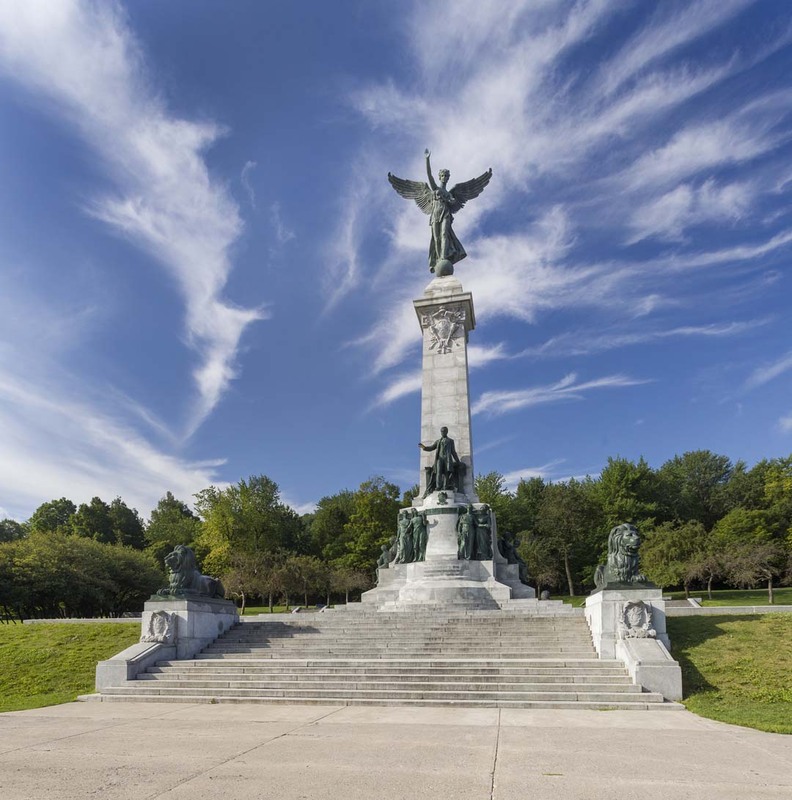 On the front face of the monument, the figure of Sir George-Étienne Cartier towers over the allegorical figures. He is portrayed standing on a podium and performing his parliamentary duties, holding a document bearing the inscription “Avant tout, soyons Canadiens” (Above all, be Canadian). Below, on either side of Cartier and placed at an angle, two statuary groups represent the four provinces that entered Confederation in 1867. 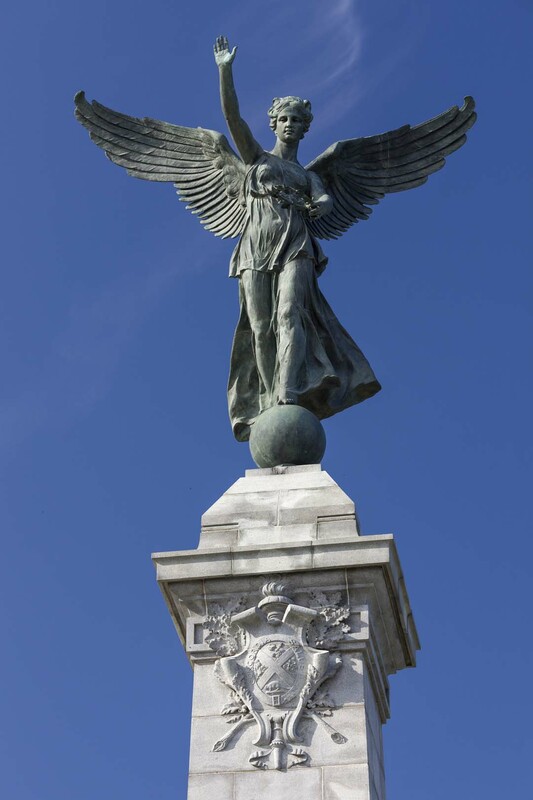 At the top of the pyramidal column, a winged female figure, La Renommée, holds her laurel crown over Cartier’s head; her supporting foot stands on a sphere. 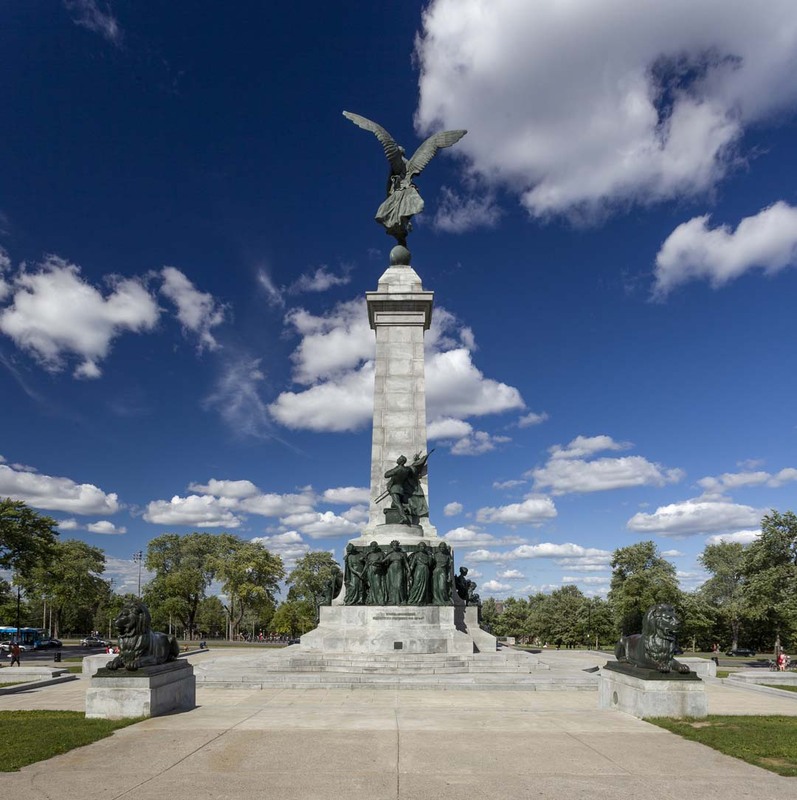 Eclecticism reigns in this monument – considered the most imposing in Montréal – as dictated by the standards of late-nineteenth-century European commemorative sculpture. Sir George-Étienne Cartier, lawyer and statesman, was born in Saint-Antoine-sur-le-Richelieu in 1814 and died in London in 1873. He became involved in the Patriotes movement early and played an active role in the conflicts of 1837–38. After a forced exile in the United States, he was elected to the Legislative Assembly of United Canada in 1848 as the member from Verchères. He was leader of the Conservative Party for 25 years and co-premier of Canada with John Alexander Macdonald from 1858 to 1862. He is recognized as one of the Fathers of Confederation; Canada was officially founded on 1 July 1867. George William Hill was born in Shipton, Eastern Townships, in 1862. He learned to carve marble in his father’s company, after he graduated from college. Between 1889 and 1894, he left Québec to study sculpting at the École nationale des beaux-arts and Académie Julian in Paris. When he returned to Montréal, he opened a studio and worked with the architect Robert Findlay and brothers Edward and William S. Maxwell. Known for his public monuments and war memorials, he is now considered one of the most important Canadian sculptors of the early twentieth century. The National Gallery of Canada, the Musée du Québec, and the Montréal Museum of Fine Art have artworks by him in their collections.